The Elgar Research Centre is currently under construction. Once completed, whether you are engaged in academic research or merely seeking to satisfy your own curiosity, the Research Centre will hopefully help you locate the information you are looking for, or at least point you towards where you might find the answer. 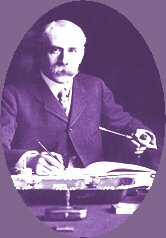 In this web-based age, the Research Centre will enable you to search on-line databases containing defining details of all Elgar's works: type of work, opus number, date of composition, date of first performance, orchestration, the locations of source material and details of recordings of the work. Onward links will lead to programme notes, the words of vocal works and recorded excerpts, with options to purchase CDs and scores of the work or hire the performing material. A separate area will provide information on the main archives holding Elgar source material: the location, opening times, contact details and a brief description of what you will find when you get there. Needless to say, although this research resource will be created by bringing together various databases initially constructed for other purposes, it will take some time to complete the task. Please revisit this area at intervals to see how we are progressing.